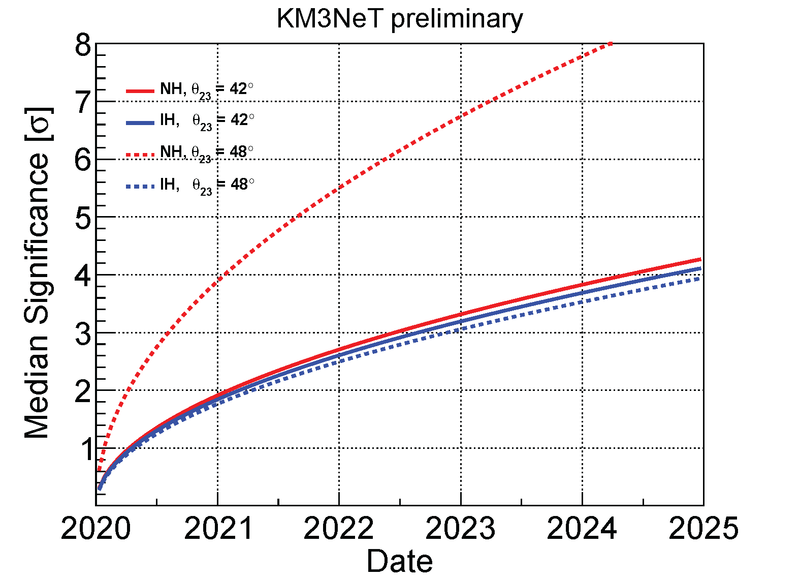 28 January 2016: Today, scientists of the KM3NeT Collaboration have publicly announced KM3NeT 2.0, their ambition for the immediate future to further exploit the clear waters of the deep Mediterranean Sea for the detection of cosmic and atmospheric neutrinos. The published Letter of Intent details the science performance as well as the technical design of the KM3NeT 2.0 infrastructure. 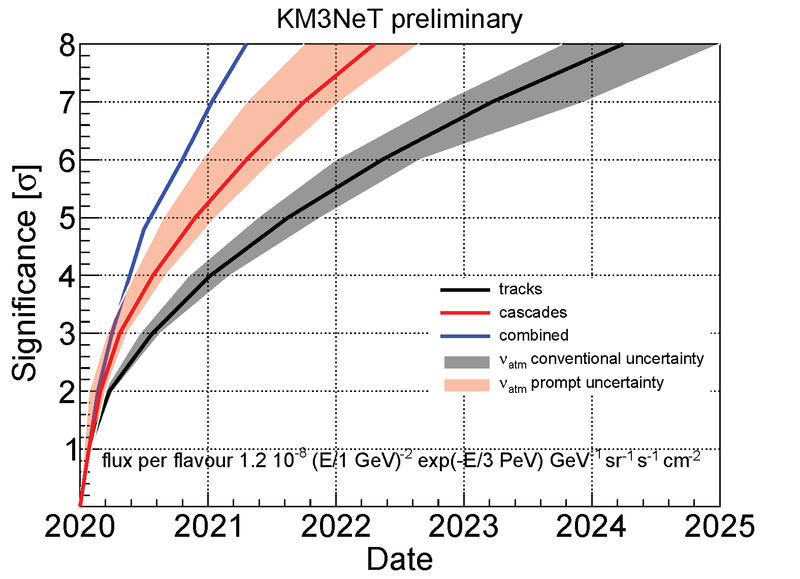 The two major scientific goals of KM3NeT 2.0 are the discovery of astrophysical sources of neutrinos in the Universe with the KM3NeT/ARCA detector and the measurement of the neutrino mass hierarchy using atmospheric neutrinos with the KM3NeT/ORCA detector. 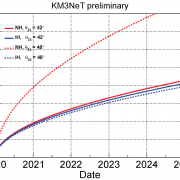 Thanks to the flexible KM3NeT design, efficient detection of neutrinos is possible over a wide energy range (GeV to PeV) with an almost identical implementation. 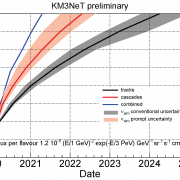 The KM3NeT scientists estimate that with the ARCA detector installed at the KM3NeT-It site south of Sicily, Italy, the observation of the cosmic neutrino flux reported by the IceCube Collaboration will be possible within one year of operation. With the ORCA detector installed at the KM3NeT-Fr site south of Toulon, France, they expect to determine neutrino mass hierarchy with at least 3-sigma significance after three years of operation. The Letter of Intent is now open for scrutiny by the neutrino scientific community and will serve as the reference document for requests for funding by the various stakeholders in Europe and abroad. Pending funding, KM3NeT 2.0 could become reality as early as in 2020. The scientific potential of the ARCA detector of KM3NeT. On the x-axis the year of operation of ARCA starting in 2020. On the y-axis the significance for observing the cosmic neutrino flux reported by the IceCube Collaboration (picture from the Executive summary of the Letter of Intent for KM3NeT 2.0). The scientific potential of the ORCA detector of KM3NeT. On the x-axis, the year of operation of ORCA starting in 2020. On the y-axis, the significance to determine the neutrino mass hierarchy using ORCA (picture from the Executive summary of the Letter of Intent for KM3NeT 2.0).